Welcome to the home page for At the Speed of Foot, Mark Fleming’s account of hiking more than 2,400 miles on the famed Appalachian Trail. 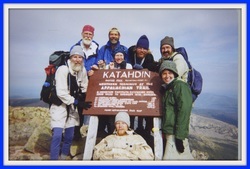 In this memoir, Mark describes the look and feel of a of a trail he followed for six months in 2002 from Georgia to Maine and his ten-week return to the trail three years later. An avid hiker, Mark came to know the trail in the Blue Ridge Mountains near his home in Virginia and the idea of hiking the entire distance—to “thru-hike” the Appalachian Trail—grew from that introduction. Mark’s spare prose and lyric descriptions put the reader on the trail with him, to share the hardship and joy of an incredible journey. Amazing Photos, Artwork & Music Combined to Create a Wonderful Photo-Music Video! This video features personal photographs and the artwork of Mark Fleming, recorded during his 180 day thru-hike on the Appalachian trail from Georgia to Maine in 2002. Many of the sketches are featured in At the Speed of Foot, Mark's account of that journey and a ten week return to the trail in 2005, which is NOW AVAILABLE FOR ORDER. The video is complimented by the wonderful music of Johnsmith, used with permission, singing the beautiful and timeless 'Appalachian Rain' song from his award-winning third album appropriately titled 'Traveler.' If you like this video or website we encourage you to share it with friends. Thank you!